CHAIRMAN: Since the period of deferral since the last public sittings in early April has been longer than expected, I think it is right that I should give some brief account of the general nature of the work of the Tribunal during that period. Apart from the daily requirements of meetings and correspondence, primary attention has been given to preparing the comparatively brief Doncaster-related phase in relation to which an opening speech will be delivered shortly. In addition, the Tribunal has been addressing a limited number of remaining matters that require to be considered and dealt with in relation to the GSM competition. This includes two particular matters to which I will be making reference in conclusion. In addition, apart from some general additional tasks related to the terms of reference, the Tribunal has been carrying on with its further preliminary inquiries into a limited number of issues relating to Mr. Charles Haughey. It was intended that public sittings in the context of the Doncaster matter would resume at a date in July, but the position is that some days prior to that intended resumption, the High Court delivered its decision in the case of O’Callaghan against the members of the Mahon Tribunal, and having regard to the additional procedural requirements entailed in compliance with that decision, the view was taken with some reluctance that it would be necessary to defer the resumption of sittings until this date, and an announcement to that effect, and with reference to the substantive reason for it, was placed on the Tribunal’s website. As we restart today, I acknowledge that the aggregate duration of the Tribunal since its substantive public sittings commenced in early 1999 has very considerably exceeded what I envisaged. I do not see it as being especially constructive to engage in debate or argument on the reasons for this, at this juncture, although both Tribunal counsel and myself have addressed some of these matters in the past. But rather I would prefer to concentrate on the imperative need of bringing matters before the Tribunal to finality. I am in no doubt that it is in the public interest that the remaining business of this Tribunal be dealt with and a report provided with the maximum expedition possible. And it is further the case that persons affected by the workings of the Tribunal are very much entitled to such a finality and report at the earliest possible juncture. In addressing a prompt conclusion as a priority, I must still have regard to the Tribunal’s terms of reference construed as a whole, and to the duty of fairness owed by the Tribunal to all persons affected by its work; but subject to this, I do reserve to myself, as Sole Member, a discretion to abridge or decide not to follow any particular potential avenue of inquiry. If every such potential avenue of inquiry were to be embarked upon, the Tribunal could undoubtedly be delayed by a further lengthy period. I am in no doubt that this must not happen. Accordingly, I intend and expect that there will be the maximum cooperation of interested persons and their advisers afforded with a view to bringing the Tribunal to a conclusion. Along with the Tribunal lawyers, I on my own behalf will grant any reasonable facility, allowance or procedural matter that may be feasible. Apart from the phase of hearings in relation to Doncaster, in relation to which an opening speech will shortly be delivered, the principal remaining matters that would then require to be addressed in evidence would seem to be, firstly, some limited matters relating to the GSM competition; secondly, some matters over and above the Doncaster issue in relation to Mr. Lowry’s tax affairs and other limited matters; thirdly, the cross-examination of Mr. Tony Boyle, as a leading member of one of the rival consortia in the GSM competition; and fourthly, some limited remaining matters that remained outstanding at the conclusion of Mr. Denis O’Brien’s quite lengthy evidence before Christmas. It does occur to me at this juncture that since it seems that the intended evidence of Mr. O’Brien Junior on the Doncaster matter is probably exceedingly brief, it should be possible by discussion between the respective teams of lawyers to devise a format in which only one rather than two appearances remain required on behalf of Mr. O’Brien. Thereafter, there remain the matters that I initially alluded to in relation to the limited number of matters affecting Mr. Charles Haughey. On an earlier occasion I stated that in taking a view as to what required to be done, I would pay considerable regard to Mr. Haughey’s age and state of health and the length of time that matters pertaining to him have proceeded. These remarks obviously apply with not merely equal but more force on this occasion. Thereafter, the remaining matter will consist of the reception of submissions on matters that have taken place before the Tribunal, and these may also relate to the aspects of recommendations which remain a requirement on various topics addressed in the terms of reference. I did allude to two fresh matters not yet dealt with in evidence as being comprised within the overall bundle of remaining items in relation to the GSM competition. And these are: Firstly, the question of the possible testimony or otherwise of Mr. Michael Andersen, the Danish consultant, in the course of the GSM competition; and secondly, a matter that was touched upon in part in the evidence of some leading witnesses on behalf of the former Esat Digifone consortium, the question of some limited measure of expert evidence by way of guidance to the Tribunal on some of the issues that arose in the course of the GSM competition. I am not in a position today to give full details in relation to either of these matters. This is because ongoing work is proceeding on both those fronts as a matter of urgency, and also because, in the course of a meeting since the last deferral of evidence on the part of Tribunal lawyers with the legal representatives of Mr. Denis O’Brien, it was intimated, I think by Mr. Coughlan, that information in relation to Mr. Andersen would not be “sprung” at an opening sitting, but that some notice would be given with a view to enabling any response. I think it fair that I should probably regard that basis of understanding as being applicable also in relation to the question of any expert report that is procured by the Tribunal. However, although I am not delivering chapter and verse on these matters this morning, I intend and expect that the position on both those matters will be pursued as a matter of urgency and will be conveyed at the end of or immediately after the timescale of the sittings on Doncaster, which I expect to be of approximately two weeks, but certainly not more than three weeks. Subject to the urgency that I have indicated, some reasonable allowance by way of time will be given to interested persons to consider and respond in relation to both those matters. Regarding the expert report aspect, the main reason why it has not proved feasible to furnish this particular document today to interested persons is because Tribunal lawyers have been endeavouring to ensure that it remains as brief, as lacking in unnecessary complexity or technicality and as devoid of matters falling outside of the terms of reference as is conceivably possible. Those were the matters I wished to address very briefly as we resume today, and at this point, I would invite Tribunal counsel, if he would, to please open the matters that will be the subject of forthcoming evidence in what is referred to as the Doncaster phase. In these coming sittings the Tribunal will be dealing mainly, as you have said, with a property transaction which has already been mentioned in the course of the Tribunal’s hearings and which will be referred to as the Doncaster Rovers transaction. It will be recalled that in 2001, I think the Tribunal examined a number of property transactions in England. The Tribunal’s examination focused on the properties known as the Mansfield property and the Cheadle property, described by reference to the places in which the properties in question were situate. References were made during the course of that evidence to a number of other properties. The Tribunal examined the apparent involvement of Mr. Michael Lowry in the transactions and the possible connections, if any, between Mr. Lowry and a number of other individuals who appear to have been involved in those transactions, including Mr. Aidan Phelan and to some extent Mr. Denis O’Brien also. At that time, the Tribunal also examined certain aspects of what has come to be known as the Carysfort transaction, to which reference had been made in even earlier sittings of the Tribunal, but at a time when the Tribunal was unaware of the material which came to its notice at the time of the examination of the English property transactions. The examination of the English property transactions was prompted in the main by information obtained by the Tribunal from Investec Bank or Woodchester Bank, as that bank was formerly known. Around that time the Tribunal had been informed in the course of its private inquiries that the Doncaster transaction concerned Mr. Denis O’Brien exclusively, and that there was no connection between the transaction and Mr. Lowry. From the evidence which was given at the Tribunal’s public sittings, there appeared to be no connection between Mr. Michael Lowry and the transaction, and nothing appeared from the evidence which would have warranted any further scrutiny of the matter whatsoever. The Tribunal’s further inquiries into the Doncaster Rovers transaction were prompted by an article published by Mr. Colm Keena in The Irish Times on the 11th January, 2003. Before dealing with the article in detail, it might be of assistance if I were to outline, very broadly, the main elements of the Doncaster Rovers transaction. Doncaster Rovers Football Club in the late 1990s had fallen on hard times, both financially and in sporting terms. And for those who are interested, it appears that its sporting profile has now improved significantly. Its ground, at the time, was leased from Doncaster Borough Council. In 1998, a proposal was put to the club which entailed the acquisition of the club’s grounds by a developer coupled with the relocation of the club to a new ground in a more accessible and a more attractive location. The attraction of this proposal for the developer was the return to be made on the redevelopment of the old ground. In this case, the transaction was seen by the purchaser, the ultimate purchaser, as an opportunity to promote a retail development on the ground. The investment opportunity in this case was identified by Mr. Kevin Phelan, who has already been mentioned in evidence. Mr. Phelan is an Irish businessman involved in property development in England. Mr. Phelan, who is no relation of Mr. Aidan Phelan, was involved in introducing Mr. Michael Lowry to the Mansfield transaction and also, at a later point, to the Cheadle transaction. The Tribunal has been informed that the Doncaster Rovers transaction was introduced by Mr. Kevin Phelan to Mr. Aidan Phelan, and at that time Mr. Aidan Phelan was sourcing and reviewing business opportunities for Mr. Denis O’Brien. From the official documentation in relation to the transaction, it appears that the purchase was taken in the name of an Isle of Man company entitled “Westferry”. Apart from the desire of the individuals involved in the purchase to avoid, for understandable business and personal reasons, the disclosure of their identities, it seems to be recognised that in a purchase such as this, which may excite strong, sentimental or emotive reactions on the part of the football supporter, it is preferable to keep the personalities involved, and especially the possibility that they may be associated with business rather than sporting circles, out of the picture. The deal was structured so that it involved a share purchase, a purchase of the shares in Doncaster Rovers, rather than a purchase of the individual assets, in this case the lease. The Tribunal has been informed that what was agreed was that Westferry would acquire the shares in Doncaster from two companies, Dinard and Shelter Trust Anstalt trust. The individuals associated with those companies were a Mr. Ken Richardson and a Mr. Mark Weaver. The consideration for the share purchase was stg.£3,700,000. Certain further sums were to be paid by the purchasers, including compensation payments to cover the costs of early termination of players’ contracts, the repayment of loans, payments in relation to the transfers of players, certain fees and so on. In addition, it was agreed that a sum of £250,000 sterling was to be paid by the purchasers to the vendors if evidence could be produced prior to the completion of the share purchase that the Borough Council had granted a new lease in respect of the car parking area adjoining the club’s main football stadium. Of the total consideration involved, amounting to in excess of stg.£4.3 million, a certain sum, approximately stg.£700,000, was retained, by agreement, to cover certain liabilities of the club that could not be quantified accurately at the time of completion. This meant that following completion, there would have to be some further dealings between the parties to establish how much of the retention fund was to be paid over, or not, as the case may be. Returning to the matters which prompted the Tribunal’s further inquiries. While Mr. Keena’s article was published on the 11th January, 2003, it appears that prior to that date, Mr. Keena had been in contact with Mr. Denis O’Brien, Mr. Michael Lowry and Mr. Denis O’Connor, Mr. Michael Lowry’s accountant and adviser, concerning material which was subsequently referred to in his article. On the 10th January, 2003 — in other words, the day before the article appeared — the Tribunal’s solicitor received a letter from solicitors acting for Mr. Denis O’Brien indicating that Mr. O’Brien had been contacted that morning by Mr. Keena. “Our client was contacted this morning by Mr. Colm Keena, who indicated that he had information which might suggest that Mr. Michael Lowry was in some way involved in the Doncaster Rovers property transaction. On the same day, the Tribunal also received a letter from Messrs. Kelly Noone solicitors, solicitors acting for Mr. Michael Lowry. To understand the letter and some of the content time in the letter, it should be remembered that in December of the year 2002, the Tribunal heard evidence from Mr. Aidan Phelan and Ms. Helen Malone which related to some of the property transactions I have already mentioned, and in particular, evidence concerning a number of solicitors’ letters purported to have been written by Mr. Christopher Vaughan, solicitor, which on one view was being examined by the Tribunal, appeared to suggest that a connection between Mr. Michael Lowry and the Mansfield transaction was being obscured, or that there was a sensitivity to the disclosure of a connection or involvement which he may have had with the transaction. The letter from Messrs. Kelly Noone indicated that Mr. Denis O’Connor, Mr. Lowry’s accountant and adviser, received a telephone call from Mr. Keena on Thursday evening, the 9th January. It also indicated that Mr. Keena had left a message on Mr. Lowry’s telephone, and that in the message had raised certain questions in connection with the Doncaster Rovers transaction. “I refer to previous correspondence. “On Friday afternoon 10th inst at approximately 2:15pm, I telephoned your office and was advised that you were away from the office until Monday next. “I was telephoning you to advise you that at approximately 7pm on Thursday 9th inst, Mr. Lowry’s accountant, Denis O’Connor, received a telephone call from Mr. Colm Keena of the Irish Times. Mr. Keena advised Mr. O’Connor that he wished to put a question to him and in effect inquired if Mr. O’Connor ever had sight of a letter of either 1998 or 1999 from Christopher Vaughan to Michael Lowry in connection with a purchase of Doncaster Rovers stadium. Mr. O’Connor informed Colm Keena that he had never received any such letter and Mr. Keena then put it to Mr. O’Connor that he (Mr. Keena) had been told that Mr. O’Connor had received such a letter sometime last year. Mr. O’Connor asked Mr. Keena to identify the party who had advised him of this, and Mr. Keena immediately declined, sighting[sic] journalistic privilege. “Mr. O’Connor advised Mr. Keena that it was most unfair to make such an allegation and then not be prepared to disclose the source. “Michael Lowry is presently out of the country, and some time later on Thursday evening the 9th inst, Mr. Keena left a message on Mr. Lowry’s mobile telephone and was phrasing questions to Mr. Lowry in relation to the matter earlier raised with Mr. O’Connor. “The writer recalls that the question of Doncaster Rovers was raised some several years ago, and Mr. Lowry informed the Tribunal that he had no involvement whatsoever with the transaction. We are concerned as to the manner in which this transaction has again now been raised, and Mr. O’Connor is particularly concerned with the allegation made by Mr. Keena to the effect that Mr. O’Connor had in his possession for some time past a letter which was relevant to this matter. This is particularly so in view of the fact that when challenged in relation to the matter, Mr. Keena immediately claimed journalistic privilege, so that whilst feeling free to make the allegation, he was not prepared to answer any question in relation thereto. “We are advising you of the foregoing at the earliest opportunity, as it seems to us reasonable to assume that Mr. Keena is preparing to make some journalistic comment in relation to the matter, and in this regard we would repeat the question posed by Mr. Donal O’Donnell, SC, at the public sitting of the Tribunal on Friday, 20th December and we quote: “and wouldn’t it be fair to say that the action of a public-spirited person who had concerns about this correspondence would be to approach the Tribunal directly with that information?” On the Saturday morning following those letters, on January the 11th, 2003, The Irish Times published a number of articles dealing with the Doncaster Rovers transaction. The articles referred to a letter dated 25th September, 1998, from Mr. Christopher Vaughan, Solicitor, to Mr. Michael Lowry, and published the text of the letter. I propose to refer to an actual copy of the letter. From Christopher Vaughan to Mr. Michael Lowry, Abbey Road, Thurles, County Tipperary, Eire, 25th September 1998. “Re: Doncaster Rovers Football Club Limited. “I was very pleased to meet you on the 24th and 25th September 1998. “My apologies for getting you to Leicester a few minutes late for your BUPA appointment. I hope that all went well and that you eventually returned to Ireland. “1. Copies of my letter of the 23rd and 25th September 1998 to Aidan Phelan. You did take a copy of the letter of the 23rd with you on the 24th. However, you will recall that two of the figures were wrong on the Completion Statement, and those have now been amended, and I would be grateful if you would destroy the incorrect copy and substitute this one. “2. I had not appreciated your total involvement in the Doncaster Rovers transaction, and I am therefore enclosing a copy of my Completion Letter which was sent to Kevin Phelan, Paul May, and Aidan Phelan on completion. “You will see that in that letter, I make reference to the divesting by Westferry of all its assets. This is a matter that I discussed with you on the 24th September, and it is absolutely vital that this process is initiated urgently. “It is not an issue that I can deal with as a solicitor as I think there is a possible conflict of interest with my involvement with Doncaster Rovers. “I think that it would be best for Aidan Phelan to arrange for the matter to be dealt with via Anglo Irish Bank and either their solicitors in London, Theodore Goddard, or Messrs. Simcocks in the Isle of Man, who dealt with the other Westferry matters, prior to the acquisition of the shares in Doncaster Rovers. “Agreement — Gameplan Internatyoin and Bryan Phelan. “I have heard nothing from Kevin since the document was faxed through to him. “I am preparing a draft agreement and I am discussing this with Paul at the moment in respect of his £120,000 and the transfer of the shares to the new Chairman. “I understand that you are trying to organise a meeting between myself and Aidan Phelan. “Obviously one of the matters to be discussed is the question of my outstanding costs, as an enormous amount of work has gone into the Doncaster Rovers acquisition and only half of my fees have been paid. Mr. Vaughan has since provided the Tribunal, as you can see from the overhead projector, with an office copy of that letter, the office copy retained by him on his file. With the exception of a correction relating to the date of one of the letters mentioned, the office copy is the same as the top copy addressed to Mr. Michael Lowry. In his letter, as I have just outlined, Mr. Vaughan states that he was enclosing copies of other letters. In a subsequent letter to the Tribunal on the 6th March, 2003, Mr. Vaughan explained that it would appear that the letters enclosed with the letter of the 25th September 1998 are as follows: A letter of the 23rd September, 1998, addressed to Mr. Aidan Phelan. “Perhaps you could let me know the arrangements for the meeting tomorrow, 24th September 1998. I am available on” — telephone number — “after 6 p.m. today, or otherwise the usual office numbers. “In the meantime I enclose a brief agenda of topics that I would like to cover. “I also enclose revised Completion and Financial Statements for your consideration. “The most important issue is returning Westferry Limited into a “shell company” with no assets as soon as possible in accordance with paragraph 5 of my letter of the 23rd August, 1998. The letter — this letter of the 23rd September, 1998, to Mr. Aidan Phelan enclosed the agenda for the meeting of the 24th September. There were two items on the agenda. One was the Doncaster Rovers item, and the other was — the other related to Beechwild, a reference to a property in Luton. The Tribunal has been informed that the Beechwild Luton property is one which concerns Mr. Aidan Phelan and Mr. Denis O’Brien only. The enclosures to the letter of the 24th September to Mr. Aidan Phelan included a copy of Mr. Vaughan’s fees, or fee note, a copy of the Completion Statement, that is the document setting out the financial state of play regarding the formal completion and handing over of the consideration for the purchase of the Doncaster Rovers property. “Deal involved sale of Doncaster soccer ground.” Then a subheading, “A letter which links Michael Lowry to a £4 million sterling property deal in 1998 was used in an attempt to squeeze money out of Denis O’Brien, Colm Keena reports”. “A complaint was lodged with the police in London last year by representatives of Mr. Denis O’Brien following the production of a letter to Mr. Michael Lowry during a mediation hearing involving Doncaster Rovers Football Club Limited. “The dispute between the two sides was then settled and a payment made which did not include any money for suppressing the letter. The letter has since been shown to the Irish Times, and the whole issue is likely to be examined by the Moriarty (Payment to Politicians) Tribunal. “While part of the background to the story of the letter involves one party trying to get money from Mr. O’Brien through the use of a letter which would cause him embarrassment, no one involved has disputed the authenticity of the document. It is understood the Tribunal has not seen the letter before. “The author of the letter, Northampton solicitor Mr. Christopher Vaughan, has told The Irish Times that he wrote it in September 1998, when he was under the mistaken impression that Mr. Michael Lowry was involved in the purchase of Doncaster Rovers Football Club Limited, a company which held a lease on the football stadium in Doncaster. The consideration involved is approximately £4 million sterling. “Mr. Vaughan was the solicitor involved in the purchase of four English properties in the late 1990s, transactions which also involved Mr. O’Brien’s then accountant, Mr. Aidan Phelan. The properties were: The Doncaster stadium; a small office development in Luton; a property in Mansfield; and a property in Cheadle. “The Tribunal has been told by Mr. O’Brien that he bought the Luton offices and the Doncaster stadium and that he had nothing to do with the other two transactions. He has said he knew nothing of the Mansfield and Cheadle transactions until they were just about to come to the attention of the Tribunal. He bought the Luton property in partnership with his then accountant, Mr. Aidan Phelan. “A businessman based in Northern Ireland, Mr. Kevin Phelan, who is not related to Mr. Aidan Phelan, was also involved in the transactions. Mr. Kevin Phelan is a businessman who locates properties in the UK which he believes might be of interest to Irish investors. “He was the catalyst for the Doncaster deal, having spotted its potential. Mr. Aidan Phelan, the Tribunal has been told, fronted for Mr. O’Brien in the deal. “The Tribunal has been told that in July 1998, Mr. Lowry was contacted by Mr. Kevin Phelan in relation to property in Mansfield. Mr. Lowry put down a £25,000 sterling, 10 percent, deposit on the property and then went to look to raise the balance. In March 1999, Mr. Aidan Phelan sourced the balance for him, paying the money into the client account of Mr. Vaughan’s practice. Mr. Lowry and Mr. Aidan Phelan have said they subsequently signed a joint venture agreement. “The letter written by Mr. Vaughan in September 1998 was written in between Mr. Lowry becoming involved in the Mansfield property and his closing the deal. Mr. Lowry subsequently became involved in the purchase of a property in Cheadle for in excess of £420,000 sterling. Again, Mr. Vaughan was involved. “The bulk of the shares in Doncaster Rovers Football Club Limited were bought by an Isle of Man company, Westferry, in August 1998. The shares bought by Westferry were held for it by Walbrook Trustees, a trust company owned by Deloitte & Touche in the Isle of Man. “The shares in Doncaster Rovers Football Club were sold by Dinard Trading, an Isle of Man company. The beneficial owner was an English businessman, Mr. Ken Richardson, who it is understood is known in Irish horse racing circles. “The lease on the Doncaster stadium could become a very valuable asset if a new stadium for the Doncaster team was built outside the Doncaster City centre, the team relocated, and permission given for the development of the old stadium site, which is in a prime location for a commercial development such as a shopping centre. “Mr. Richardson was charged and convicted in 1999 of trying to burn down the Doncaster grounds in 1995. Mr. Richardson was convicted of conspiracy to commit arson and jailed for four years. Sheffield Crown Court was told that the wealthy businessman offered £10,000 sterling to a former SAS soldier to start the fire at the club’s grounds, causing damage put at £100,000 sterling. “The Prosecution said Mr. Richardson’s intention was to try to force Rovers to move to a new stadium. “The plan failed when Mr. Alan Kristiansen, who was hired to start the fire, left his mobile phone at the scene and a message on Richardson’s answering machine saying, ‘The job’s been done’. “When Westferry was buying the stadium, some money, understood to be approximately half a million pounds sterling, was placed by the purchaser in a joint account controlled by Mr. Vaughan and the solicitor acting for Mr. Richardson. “These “retention funds” which are referred to in Mr. Vaughan’s letter were to be paid out in whole or in part to Dinard, depending on liabilities which might or might not arise after the sale of the shares to Westferry. “When the time came at the end of 1998, the two sides could not agree on how much of the retention money should be paid on to Dinard. Mr. Richardson’s side initiated litigation against Westferry. This led to a mediation hearing before an english barrister last autumn during which the letter from Mr. Vaughan was produced. There were two other articles in the newspaper on that day dealing with the same matter. The first one, to which I want to refer under the heading, “Solicitor says he was incorrect in linking Lowry to Doncaster deal”, Mr. Keena says, “An English solicitor has confirmed that he wrote a 1998 letter which links Mr. Michael Lowry to a £4 million sterling property deal in Doncaster. “The solicitor, Mr. Christopher Vaughan, said he wrote the letter when under the misapprehension that Mr. Lowry was involved in the deal. He said this subsequently transpired to be incorrect. “Mr. Denis O’Brien told the Moriarty (Payments to Politicians) Tribunal in October 2001 that he bought the property and is still the owner. “Mr. O’Brien’s former accountant, Mr. Aidan Phelan, has told The Irish Times that Mr. O’Brien has at all times owned the property and that this can be demonstrated and will be shown to be so. “At the time the letter was written, Mr. Vaughan was working with Mr. Lowry in relation to the purchase of property in Mansfield for about £250,000 sterling. “A letter from Mr. Vaughan to Mr. Lowry dated September 25th 1998 and which has been seen by the Irish Times is headed “Re Doncaster Rovers Football Club Limited.” The company own the lease on a stadium in Doncaster. The two-page letter reads, in part: ‘I had not appreciated your total involvement in the Doncaster Rovers’ transaction’. “Mr. Vaughan, when contacted, said he couldn’t discuss the letter. ‘I can’t talk without my clients’ consent, not that they are my clients any more,’ he said. “However, he then agreed he had written a letter which ‘sounds like the one’ seen by the Irish Times. He said he had written to Mr. Lowry in relation to the Doncaster stadium. ‘It was written by me but rapidly forgotten by me because I don’t think Michael Lowry had anything to do with the matter’. ‘It was represented to me by someone else that he had an involvement in it,’ Mr. Vaughan said. He would not say who this person was. He said it was during a trip to Leicester, mentioned in the letter, that it was said to him that Mr. Lowry may be able to assist. Mr. Lowry was with him on this trip but Mr. Vaughan would not explain the matter further. “He said that during the acquisition of Doncaster Rovers Football Club Limited, he never got any instructions from Mr. Lowry in relation to the matter. Mr. Vaughan said he had not changed his mind in relation to attending the Moriarty Tribunal. ‘I have no intention of coming to the Tribunal,’ he said. He said he was aware the police in the UK were investigating the misuse of the letter. “Last year copies of two letters from Mr. Vaughan to Mr. Kevin Phelan, a Northern Ireland businessman who was involved in property deals in the UK, were given to the Irish Times. The letters concerned a property in Cheadle which had been bought by Mr. Lowry using Mr. Vaughan. “The copies of letters given to the Irish Times were different from the versions given to the Tribunal by both Mr. Vaughan and Mr. Phelan. “It seems the copies given to the Irish Times were the correct versions and that the amended versions given earlier to the Tribunal were changed so as to excise Mr. Lowry’s name. “The changes had the effect of indicating that Mr. Lowry was no longer involved with the property at the dates on the letters July and September 2000. “Both Mr. Vaughan and Mr. Kevin Phelan are refusing to come to Dublin to give evidence. Mr. Vaughan has said the letters about Cheadle may have been written in error; that he sometimes became confused when dealing with the Cheadle transaction. “Mr. Aidan Phelan, a Dublin accountant who was involved in the Cheadle transaction, has said he believes the letters to The Irish Times last year were forgeries created by someone to make mischief. The last article is headed: “Lowry linked to £4m deal by letter.” Subheading: “Lawyer believed former minister was ‘totally involved'”. “New evidence has emerged linking Mr. Michael Lowry to a £4 million sterling property deal involving Mr. Denis O’Brien in Britain. “A letter concerning the planned purchase of Doncaster Rovers’ football stadium shows a key adviser to Mr. O’Brien believed the former Minister had a ‘total involvement’ in the deal. “On learning yesterday that the Irish Times had seen the letter, lawyers from Mr. O’Brien contacted the Moriarty Tribunal to explain it. Previously the Tribunal had been told by Mr. O’Brien that he alone bought the football grounds. 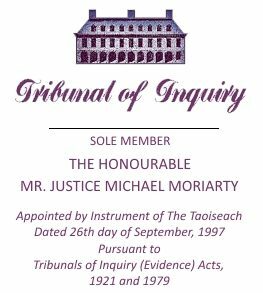 “The Moriarty (Payments to Politicians) Tribunal was told by Mr. O’Brien in October 2001 that he bought the property, a football stadium and that it still belongs to him. “The 1998 letter seen by the Irish Times was written by the solicitor who acted in the transaction and is addressed to Mr. Lowry at his County Tipperary home. “The solicitor, Northampton-based Mr. Christopher Vaughan, has admitted he wrote such a letter to Mr. Lowry. However, he said that he was under the misapprehension at the time that Mr. Lowry was involved in the transaction and it later turned out that this was not the case. “A spokeswoman for Mr. O’Brien, the multi-millionaire who set up Esat Digifone, said yesterday that he is categorically of the view that Mr. Lowry is not and never was connected with the purchase of Doncaster Rovers Football Club Limited, the company which owns the lease on the Doncaster stadium. “She said the issues surrounding the whole matter would be made very clear to the Tribunal. “Mr. Aidan Phelan, Mr. O’Brien’s former accountant, who was involved in the Doncaster deal, said; ‘I was the project manager with this transaction up to fairly recently, and I can say that Michael Lowry had no involvement in this transaction at any stage’. He said this could be, and would be, demonstrated clearly. “Mr. Lowry, when contacted, said he did not wish to comment. His accountant, Mr. Denis O’Connor, who is helping Mr. Lowry in his dealings with the Revenue Commissioners and the Moriarty Tribunal, said he had never seen a letter linking Mr. Lowry to the Doncaster stadium. He said that if Mr. Lowry ever had any involvement with the Doncaster stadium, ‘then I throw my hat at it’. “The Tribunal is already investigating two English property transactions in the late 1990s which involved Mr. Lowry and Mr. Phelan and in which Mr. Vaughan acted as solicitor. Mr. O’Brien has said he knew nothing about these transactions at the time. The properties involved are in Cheadle and Mansfield, and the total amount involved was about 700,000 sterling. “The letter shown to the Irish Times is accepted as being genuine by the parties concerned and has not been seen by the Tribunal. “The shares in Doncaster Rovers Football Club were bought by an Isle of Man company, Westferry Limited, in August 1998. The shares were sold by another Isle of Man company, Dinard Ltd, which is owned by an English businessman, Mr. Ken Richardson. “The stadium in Doncaster is on a site which could be profitably developed if the football team which plays at the stadium, Doncaster Rovers, was supplied with a new grounds. Mr. Richardson was jailed in 1999 for conspiring to have the stadium burned down. “Last year a complaint was made to the police in London by representatives of Mr. O’Brien after the 1998 letter from Mr. Vaughan to Mr. Lowry was produced during negotiations between representatives of Mr. O’Brien and Mr. Richardson. Now, lest there be any doubt about it, Mr. Lowry’s solicitors, having intimated as much in the letter I mentioned a moment ago, in a subsequent letter of the 28th January, 2003, indicated that the suggestion that he was involved in the Doncaster Rovers transaction was erroneous. “Dear Mr. Vaughan, “I refer to previous correspondence. I enclose copies of a number of articles from the Irish Times for Saturday, 11th January, 2003, in which reference is made to you and the activities of some of your then clients. “My purpose in writing is to seek your confirmation concerning a number of assertions contained in these articles. Assuming that you are prepared to assist the Tribunal, I would be obliged for your responses to the queries which I have set out below. You have already received a waiver from Mr. Michael Lowry and Mr. Aidan Phelan to enable you to respond to queries from the Tribunal. To the extent to which it may be necessary, the Tribunal proposes to endeavour to obtain a waiver from Mr. Denis O’Brien. I do not anticipate that this will be necessary to enable you to respond to most of the queries, and assuming that you are disposed to assist the Tribunal, I would be obliged for your assistance at your very earliest opportunity. “1. In an article on the front page of the Irish Times entitled “Lowry link to stg£4 million deal by letter” (“the first article”) Mr. Colm Keena states: “The solicitor, Northampton-based Mr. Christopher Vaughan has admitted that he wrote such a letter to Mr. Lowry.” This is a reference to a letter, the full contents of which are contained at page 5, in an article headed “Deal involved sale of Doncaster soccer ground” (“second article”). Please confirm that the letter, a copy of which is contained in the second article, emanated from your office and that it was drafted and signed by you. Please let me have your office copy of the letter. “Mr. Vaughan, when contacted, said that he couldn’t discuss the letter: ‘I can’t talk without my clients’ consent, not that they are my clients any more’, he said. However, he then agreed he had written a letter which ‘sounds like the one’ seen by the Irish Times. He said that he had written to Mr. Lowry in relation to the Doncaster stadium. Mr. Vaughan said that it became apparent subsequent to the letter being written that Mr. Lowry had no involvement in Doncaster at all. ‘It was represented to me by someone else that he had an involvement in it,’ Mr. Vaughan said. He would not say who this person was. He said it was during a trip to Leicester, mentioned in the letter, that it was said to him that Mr. Lowry might be able to assist. Mr. Lowry was with him on this trip but Mr. Vaughan would not explain the matter further. “3. In relation to the trip to Leicester, please let me know the purpose of the trip, how the trip was taken, and who accompanied you on the trip. “4. By whom was it stated in the course of the trip that Mr. Michael Lowry was involved in the Doncaster transaction. “5. Was Mr. Lowry present when any such statement was made, and if so, what did he say? “6. By whom was it stated in the course of the trip that Mr. Lowry might be able to assist. “7. In what way was it envisaged Mr. Lowry may be able to assist? “8. What was Mr. Lowry’s response to the suggestion that he might have been able to assist? “9. With reference to the statement in the letter of the 25th September that you had met with Mr. Lowry on the 24th and 25th September, 1998, please let me have full details of any such meetings together with copies of all attendances or other memoranda or notes made by you or made on your direction, or if not made by your direction, obtained by you or your firm. Please let me have details of the purpose of the BUPA appointment. “10. Please let me have details of what led you to form the impression that Mr. Lowry had a ‘total involvement’ in the Doncaster Rovers transaction. Please let me have a copy of the completion letter and all the other letters or documentation retained by you in connection with this transaction. To the extent to which it may be necessary to obtain waivers from other clients of yours to enable to you furnish these documents, you may defer responding to this query until such time as the waivers are provided. “11. Please let me have a full account of your understanding of any involvement Mr. Paul May had with Mr. Michael Lowry. “12. In the course of the letter, you refer to the potential for “expensive, unnecessary and embarrassing litigation”. In this connection, please let me know what you mean by the prospect of “embarrassing” litigation. “13. In the letter, you also state that it was your understanding that Mr. Michael Lowry was ‘trying to organise a meeting’ yourself and Aidan Phelan. Please let me have full details of how you came to understand that Mr. Michael Lowry was organising this meeting, and please also let me have an account of the purpose for which the meeting was being organised. Please also let me know when the meeting was held and what transpired at the meeting. “14. In the third article, it is suggested that you informed Mr. Colm Keena that after you had written the letter of 25th September 1998 to Mr. Michael Lowry, ‘It quickly emerged that he was not involved’. Please let me have full details of how it emerged that Mr. Lowry was not involved. “Mr. Michael Lowry or any agent or representative of his. “Mr. Aidan Phelan or any agent or representative of his. “Mr. Kevin Phelan or any agent or representative of his. “Mr. Paul May or any agent or representative of his. “Mr. Ken Richardson or any agent or representative of his. “In relation to any of the foregoing, please note that a reference to any individual should include a reference to any entity, whether corporate or otherwise, with which that individual is associated. ‘It is not an issue that I can deal with as a solicitor as I think that there is a possible conflict of interest with my involvement in Doncaster Rovers’. Please let me have full and detailed particulars of your involvement with Doncaster Rovers and your dealings, direct or indirect, or the dealings of your firm, direct or indirect, with Mr. Ken Richardson or with any corporate or other entity with which Mr. Richardson was associated. I take it that the reference to “your involvement” with Doncaster Rovers is not a reference to an involvement as a legal adviser. If you were involved as a legal adviser, please let me know whether you are prepared to obtain waivers from the relevant clients to enable you to respond to this query. “I refer to your letters of the 13th and 16th January 2003 concerning articles which appeared in The Irish Times on Saturday, 11th January, 2003. “I am now in a position to review my files in connection with the acquisition of Doncaster Rovers Football Club Limited (DRFC). The letter quoted in The Irish Times and dated 25th September 1998 was drafted by me (there are one or two small discrepancies in the letter.) I attach a copy of the letter which I have taken from my file. You will also note that the top copy did not have a typing error as to a date in the first line of the paragraph numbered 1, which has not been amended on my file copy. “A man who introduced himself as Colm Keena telephoned me on my mobile telephone at about 6:30pm on 9th January 2003 whilst I was at Newport Pagnell Service Station on the M1 Motorway paying for some fuel. He spoke to me for a fairly short period of time, and I think what you have set out in paragraph 2 of your letter of the 13th January, 2003, represents the total extent of our conversation. “The Completion of the acquisition of DRFC was on the 18th August, 1998, and following that Completion, I had been pressing Kevin Phelan to arrange a meeting with Aidan Phelan and myself in connection with a number of outstanding issues. Therefore, when Kevin Phelan arranged the meeting for the 24th September 1998, I initially assumed it was in connection with DRFC and that Aidan Phelan would attend. “Accordingly, I wrote to Aidan Phelan, on the 23rd September 1998, enclosing an agenda of the items I wished to discuss at that meeting. I attempted to fax the letter to Aidan Phelan the day before the proposed meeting but was unable to do so. The letter was posted to Aidan Phelan with the enclosures referred to at a later date. “Subsequently it transpired that the meeting was not to be in connection with DRFC but in respect of the purchase of the land at Hilltop Farm, Mansfield (the Mansfield property), by Michael Lowry. “I met Kevin Phelan and Michael Lowry on the 24th September. We had a general discussion about the Mansfield property. I believe that Kevin Phelan broadened the discussion by raising queries on other projects which he was involved in. I would have certainly raised with Kevin Phelan the issue as to the outstanding matters in DRFC and the need to have a meeting with Aidan Phelan to consider those matters, and I gave him a copy of my letter dated 23rd September 1998, which I had unsuccessfully attempted to fax to Aidan Phelan the previous day. “Michael Lowry was present throughout the whole of those discussions, and I formed what I subsequently discovered to be a totally incorrect view, that because of the frank manner in which Kevin Phelan was discussing the outstanding issues relating to DRFC, Michael Lowry was somehow involved in the DRFC project. “Michael Lowry and Kevin Phelan then wanted to go on to have a meal somewhere, but I returned to my home. It was arranged for Michael Lowry to come to my office the following day to finalise some of the details relating to the Mansfield property and for me to speak to the vendors solicitor in respect of the property. “Michael Lowry was brought to my office early in the morning of the 25th September, presumably by Kevin Phelan, but I have no note or recollection of meeting Kevin Phelan on that day. It had been arranged that a car would come to my office and collect Michael Lowry during the course of the morning and take him to Leicester for an appointment at the BUPA hospital. The car failed to arrive (I cannot recall what went wrong), and I then offered to take Michael Lowry in my car to the BUPA hospital in Leicester, which is about 30 miles north up the M1 Motorway from my office. “Following Michael Lowry arriving at my office on the morning of the 25th September, we examined the Mansfield property file. I contacted the vendors’ solicitors as to the issues that had arisen from our discussions as to the purchase of that property. “No one else travelled in my car to Leicester other than myself and Michael Lowry. “So far as I can recall, the discussions in the car related to the general property market in England, sport, and Irish politics. “Based on my incorrect assumption from the previous day’s meeting, the outstanding issues relating to DRFC were again touched on again by me. It is my recollection that Michael Lowry offered to assist me in resolving those outstanding issues by agreeing to try to arrange a meeting with Aidan Phelan, whom he led me to believe he knew. “I have found no handwritten notes on DRFC file in relation to the meeting on the 24th September or the discussion in the car the following day, which is not surprising, as Michael Lowry had come to Northampton to discuss the Mansfield property. “In hindsight, it does seem unusual that I believed Michael Lowry to be involved in DRFC, as throughout the whole of the discussions and negotiations relating to the acquisition of DRFC over a period of some nine months, I had never heard Michael Lowry’s name mentioned, nor met him with Aidan Phelan or any other person in connection with the acquisition of the DRFC. “When I returned to my office in the afternoon of the 25th September, in an attempt to try and move matters along (as can be seen from the tenor of my letter), I wrote the letter of the 25th September to Michael Lowry. “Over the course of the next days (which was the weekend), I spoke to Kevin Phelan, who enquired of me as to how my journey to Leicester with Michael Lowry had gone. I outlined to Kevin Phelan that we had discussed the purchase of commercial property in England in general and the Mansfield property in particular, which I understood had been Michael’s main purpose in visiting me in Northampton. “I must have also told Kevin Phelan that I thought that Michael Lowry could assist in resolving the outstanding issues in DRFC and that I had written the letter of the 25th September to Michael Lowry. I had also written a letter to Aidan Phelan advising him that I considered that Michael Lowry could arrange a meeting. “Kevin Phelan then informed me that Michael Lowry was not connected in any way whatsoever to the DRFC project and that it would be very embarrassing for him if Aidan Phelan had been informed by me that any documentation had been sent to a third party (Michael Lowry). “Kevin Phelan asked me to write to Aidan Phelan to clarify the situation, and it was at this stage that I informed Kevin Phelan that although the letter had been dictated and typed, it had not gone through my fax machine; neither had it been posted, and a copy of that letter which has a line through it still exists on my file. The top copy I assume was destroyed by me. “As regards the involvement of Paul May, he was brought into the DRFC project by Kevin Phelan to be responsible for the day-to-day management of the football club. I do not believe that Michael Lowry had any involvement with Paul May or with the management of the club. “As part of the agreement to purchase the shares in DRFC, Westferry Limited had agreed to pay an additional sum of £250,000 upon the production of an extension to the lease between Doncaster Metropolitan Borough Council as landlord and DRFC as tenant in respect of the car park adjoining the football stadium. “It subsequently transpired that the vendors of the shares in DRFC (a Mr. Richardson and a company and a trust associated with him) had totally misrepresented the situation, as in fact the lease extension was already in place and within the ownership of DRFC. This was perceived to be extremely embarrassing situation that there was in existence an extension to the lease but that fact had been missed when a due-diligence examination of the documentation relating to DRFC was carried out prior to the exchange of contracts by the purchasers. The Tribunal has been provided with the official contractual documents relating to this transaction. On the face of it, these official documents contain no references whatsoever to Michael Lowry. Of course, they do not contain any references for that matter to the individuals behind the corporate purchaser, namely Westferry, but the Tribunal has been informed that Westferry held its interest for the benefit of an trust, a trust benefiting the O’Brien family, and that effectively the O’Brien family interests were the purchasers of the property. As I have already mentioned, following the completion of the sale, there were a number of outstanding issues. There were difficulties in resolving these issues, and eventually those difficulties resulted in a dispute. This dispute led to litigation. Efforts were made to compromise or settle the litigation, and eventually the parties, in anticipation of going to court and having fixed a date for a court hearing, nevertheless agreed to embark on a formal alternative dispute resolution procedure, namely a mediation process. For the purpose of handling the litigation and the mediation process, separate solicitors were engaged by the purchasers, Westferry; that is to say, by the O’Brien interests. The solicitors involved were the well-known London firm of Messrs. Peter Carter-Ruck. The solicitor actually dealing with the matter was a Ms. Ruth Collard, an experienced solicitor and a partner in that firm. From documentation made available to the Tribunal by Ms. Collard with the consent of Westferry, it would appear that in the course of dealing with the litigation and mediation of the dispute between the vendors and the purchasers, Mr. Denis O’Connor, Mr. Lowry’s accountant and adviser, became involved. It would appear from other documents, to which I will not refer at this point, that a meeting had been arranged between Mr. O’Connor and Ms. Collard and a Mr. Craig Tallents, an accountant advising Westferry and the O’Brien interests, in progressing the retention issue. From Ms. Collard’s files it would appear that a Mr. John Ryall, who was working for the O’Brien interests in Dublin, authorised her to attend a meeting with Mr. O’Connor with a view to discussing certain matters in relation to the disputed items. He informed Ms. Collard that Mr. O’Connor was not representing either Westferry, the purchasers, or Dinard, the vendors, but that he might be able to assist in resolving the matters. That meeting was fixed for the 10th September, 2002. Ms. Collard kept an attendance note of the meeting, and once again with the permission of Westferry, this note has been provided to the Tribunal. “Attendance note, Ruth Collard, 10th September, 2002. Subject: Doncaster Rovers Football Club — contract dispute”. Then there is a file number. “RC” — meaning “Ruth Collard” — “attending meeting with Craig Tallents and Denis O’Connor. Discussing the position in the litigation generally with Craig Tallents prior to Denis O’Connor’s arrival. “Denis O’Connor said he would explain how he had become involved in the matter. He had been trying to sort out, on Denis O’Brien’s behalf, the position with Kevin Phelan. Denis O’Connor had represented someone who had been in partnership with Kevin Phelan, and Kevin Phelan had made trouble for him at the same time. In discussions with Kevin Phelan, he had mentioned the litigation and the position with the retention fund. At one point, Kevin Phelan had told him that he had spoken to Mark Weaver, who had said that he would drop the £250,000 sterling claim if Westferry handed over the retention fund and dropped the payroll claim. He would do this for an “Uplift” of £25,000 sterling and in return for an opportunity to sell the stadium at Doncaster. Ruth Collard asked what was meant by an “Uplift”, and Denis O’Connor said he had no idea. “Denis O’Connor said he was also representing a member of the Irish parliament, Michael Lowry. He was being investigated as part of the Moriarty Tribunal proceedings in Dublin. Kevin Phelan had made various threats to cause trouble for Michael Lowry. “Denis O’Connor said he had discussed the position with Denis O’Brien” — and I think it should be clear that this is a reference to Mr. Denis O’Brien Senior — “and learned about the mediation which was to take place. Denis O’Brien Senior had said to Denis O’Connor that the mediator would impose a binding agreement on the parties. Denis O’Connor said when he had said this to Kevin Phelan, Kevin Phelan had said this was not correct and had telephoned Mark Weaver” (that’s “MW”) “who had sent a fax through of part of the mediation documents. I have already mentioned that Mr. Weaver is an associate of Mr. Richardson’s. “Denis O’Connor said it was clear from this that the mediator would not impose his decision. Ruth Collard says this was correct and was the essence of mediation. She was surprised that Denis O’Brien” — meaning Denis O’Brien Senior — “had not apparently understood this as it had been made clear to Aidan Phelan on several occasions. “Denis O’Connor said the upshot of all his discussions with Denis O’Brien and Kevin Phelan had been that he had been asked if he would be prepared to meet Ken Richardson and Mark Weaver, and at Denis O’Brien’s request a meeting had been arranged, first in Manchester and then in Dublin. Denis O’Connor said from all he had heard, if his discussions with Ken Richardson and Mark Weaver to settle the matter were not successful and it went to mediation, the mediation would fail. He said that the other side were laughing at us and that they would ensure that the mediation did not succeed, and they would then take the matter to court. They wanted to cause the maximum embarrassment for Denis O’Brien and for others, including Michael Lowry. Ruth Collard asked how they could cause any embarrassment to Michael Lowry, as, so as far as she was aware, he had no connection to the proceedings. Denis O’Connor said that Michael Lowry did have a connection and that he had been in the room when discussions had taken place between Kevin Phelan and Ken Richardson regarding the lease. Ruth Collard said no one had ever suggested that to her previously. “Ruth Collard said that the position was that we had been trying to talk to them about a settlement for nearly a year. Ruth Collard said that their legal advisers, Reg Ashworth, and their counsel, seemed keen to talk about a settlement, but Reg Ashworth had always said to her that his clients would not settle. We had seen their agreement to the mediation as a major step forward. Ruth Collard said that Denis O’Connor might say they were laughing at us in relation to this, but her experience of mediations was that they often did achieve settlements, and Ken Richardson and Mark Weaver would find that they came under a lot of pressure from their lawyers and from the mediator to settle, if a reasonable deal was put to them. “If they did not settle, Ruth Collard did not regard their threats to expose various matters in court particularly seriously. If the mediation failed and the case went forward, we would be making a substantial payment into court at an early stage. If they wanted, they could go on after this, but if our payment was well judged, it would put enormous pressure on them, and it would be very expensive if they failed to beat the sum paid in. Ruth Collard said she was telling Denis O’Connor this so that he should not be too impressed by what Kevin Phelan was telling him. The fact was that there were merits in their claim and vulnerabilities in our case, but they also had vulnerabilities, and we were not without resources. Ruth Collard said it was very important that we did not appear desperate to settle. “Denis O’Connor said he understood this. He said it would be helpful if he could have an outline of the factual matters. Ruth Collard said she would ask Craig Tallents to explain the background to the litigation, as he could explain the accountancy details. Craig Tallents then ran through the background, dividing the matter into three issues: The retention fund; the claim in respect of the lease; and our claim in respect of the payroll warranty. Denis O’Connor said he now began to appreciate that the issues were extremely complex. He wondered how he would be fully briefed prior to the meeting taking place. Agreeing that Denis O’Connor needed a further briefing and that Ruth Collard would prepare a file for him consisting of Craig Tallents’ original briefing documents and the pleadings. “At the conclusion of the meeting, Ruth Collard reiterated that Denis O’Connor should not be too impressed by the threats he had heard. If the mediation did not work, then that would be a pity, but we would move on. Denis O’Connor said that one good thing was that Kevin Phelan would now be a witness for us. Ruth Collard said it might be helpful that he would not be available to the other side, but he would be a much discredited witness, and she was far from sure we would want to use him. Then there is a reference to the time engaged, and so forth. At this point it’s important to state that just as Mr. Vaughan, in his letter to the Tribunal of the 6th March, 2003, furnished an account of the circumstances surrounding the letter of the 25th September, Mr. Denis O’Connor has responded to queries from the Tribunal, and the details of his response will be referred to later, but he has indicated in general terms that Ms. Collard is wholly mistaken in suggesting that he had in any way implicated Mr. Lowry in any aspect of the Doncaster Rovers transaction. Firstly, that the official documents relating to the Doncaster transaction — that is, the contractual documents — made no reference to Mr. Lowry. Secondly on the other hand, Mr. Christopher Vaughan, the solicitor acting for the purchasers in the transaction, that is Mr. O’Brien’s interest, refers to Mr. Lowry as having a total involvement. Of course Mr. Vaughan has qualified that statement in a subsequent letter, but the fact remains that the letter of the 25th September, presumably, or at least apparently reflects his state of mind at the relevant time in September 1998. Mr. Vaughan of course had no interest at that time to damage Mr. O’Brien’s interests or Mr. Lowry’s interest; neither has he any interest at this time to damage their interests. Thirdly, Mr. Vaughan was at the relevant time, in September 1998, also acting for Mr. Lowry in another transaction. Fourthly, Ms. Ruth Collard of Carter-Ruck solicitors, while acting as solicitor for the O’Brien interests in September, 2002, and having no interest to injure or to damage either Mr. Lowry or Mr. O’Brien, recorded an involvement of Mr. Lowry in the transaction. The Tribunal is left with a situation in which two experienced and responsible solicitors, notwithstanding the absence of official references to Mr. Lowry in the contractual documents, nevertheless record at various times an involvement on the part of Mr. Lowry or representations concerning an involvement on the part of Mr. Lowry in the transactions. It is clear from what Ms. Collard has recorded, and indeed from what Mr. O’Connor has informed the Tribunal, and to which I will refer later, that Mr. O’Connor, Mr. Lowry’s adviser, was involved in the transaction at a critical time in the dispute between the vendors and the purchasers. What is unclear at this stage is the precise capacity in which he was involved in the transaction. If Ms. Ruth Collard’s record is correct, then it would suggest that Mr. O’Connor was involved in the transaction at a time when he was not acting for either the interests of the O’Brien family or the interests of the vendors; and further, if she is correct, that he represented to her and to Mr. Craig Tallents that Mr. Lowry had a connection to the transaction. In pursuing its inquiries into the circumstances of the transaction, the Tribunal received a considerable quantity of documents dealing with the contract and the post-contract period. The Tribunal has raised a number of queries with individuals involved in the transaction, and while it has not received a comprehensive or narrative response from all of the people involved, the Tribunal’s books, made available to the various interested parties, do contain comprehensive and narrative responses from Mr. Aidan Phelan, Mr. Denis O’Connor and Mr. Michael Lowry. It is anticipated that in due course, in addition to the documentation she has already provided, a narrative statement will be provided by Ms. Ruth Collard. The Tribunal has obtained written responses from Mr. Christopher Vaughan, and while the Tribunal has recently had a useful private meeting with Mr. Vaughan, it has not yet proved possible to persuade him to attend to give evidence. The Tribunal has not, however, given up the prospect that Mr. Vaughan will make himself available to give evidence. The Tribunal does not anticipate that evidence will be available from Mr. Kevin Phelan. Like Mr. Vaughan, he resides outside the jurisdiction, and therefore, neither of them can be compelled to attend. The Tribunal does not anticipate that the two individuals associated with the vendor of the Doncaster Rovers shares, namely Mr. Ken Richardson and Mr. Mark Weaver, will be attending, and again, as they reside outside the jurisdiction, they cannot be compelled to attend. CHAIRMAN: Ten to two. Thank you. MR. HEALY: I think that before lunch, Sir, I was referring to some of the witnesses who would be available and explaining that some witnesses would not be available, as far as the Tribunal could work out, and that there was a prospect that Mr. Vaughan might be available, or at least that I wouldn’t rule out the prospect that he would be available. To return to the transaction itself, from the information provided by various individuals involved in the transaction, the Tribunal has learned that it was overseen in the main by two people on behalf of Mr. Denis O’Brien, namely Mr. Aidan Phelan and Mr. Denis O’Brien Senior, who was Mr. Denis O’Brien’s father, and he appears to have taken over the supervisory role in the transaction on behalf of Mr. O’Brien’s interests in the latter stages of the transaction. From the documentation provided to the Tribunal by Mr. Denis O’Brien Senior and by Mr. Christopher Vaughan, it appears that the project was originally handled primarily by Mr. Aidan Phelan and, to some extent, Mr. Kevin Phelan. Mr. Aidan Phelan, in fact, as it were, fronted the project, and as I mentioned to some extent earlier in referring to the nature of the project, this appears to have been, for quite understandable commercial reasons, of no interest to the Tribunal, to keep Mr. O’Brien’s name out of the picture. Mr. Aidan Phelan has informed the Tribunal that he ceased to be centrally involved in the project from around June of 2002, and that from that time onwards, the overall management of the project passed into the hands of Mr. Denis O’Brien Snr. Mr. Denis O’Brien Snr. had certain dealings with Mr. Denis O’Connor in connection with the project. Mr. O’Connor has informed the Tribunal that he had become aware of the Doncaster Rovers project in 2001, probably in July or August of that year, and this arose from conversations he had with Mr. Kevin Phelan. While we know from earlier evidence that he had dealings with Mr. Kevin Phelan in connection with Mr. Lowry’s property and that he was aware of Mr. Phelan’s involvement with Mr. Lowry in connection with English properties, in particular Cheadle, Mansfield and Vineacre, did he not become aware of any of those properties, or Mr. Lowry’s involvement in them, until March 20001, as he has already stated in evidence. Mr. O’Connor has informed the Tribunal that prior to 2001, he knew Mr. Kevin Phelan, and he knew that Mr. Kevin Phelan was aware that he, Mr. O’Connor, had clients, not Mr. Lowry, who were involved in the UK property market. Around the time that Mr. O’Connor first became aware of the Doncaster Rovers transaction, he formed the impression that Mr. Aidan Phelan was exclusively in charge of and managing the project and at that time assumed that Mr. Phelan, Mr. Aidan Phelan, that is, was the beneficial owner, as it were, of the project so far as the contractual rights of the purchasers were concerned. He had the impression that Mr. Kevin Phelan had sourced the site and identified the business opportunity; that the vendors were a Mr. Ken Richardson and a Mr. Mark Weaver; that the purchase had not fully completed and that there was a continuing dispute in connection with monies retained following formal completion; that the dispute had become acrimonious, and that Mr. Kevin Phelan was due monies out of the deal, including a success bonus. Also in 2001, Mr. O’Connor travelled, on behalf of Mr. Lowry, to Manchester specifically to meet Mr. Kevin Phelan with a view to examining the Mansfield site, the Vineacre site in Wigan, and the potential possibility of a deal on the Cheadle site. This was after Mr. O’Connor became aware in or around March of 2001 of Mr. Lowry’s English property transactions. The visit was for the purpose of physically inspecting the property and forming a clearer picture of the Mansfield deal. Although his visit to England was, so Mr. O’Connor has informed the Tribunal, with a view to examining only those properties with which Mr. Lowry was connected or likely to be connected, Mr. Kevin Phelan, in the course of Mr. O’Connor’s visit, suggested that they examine the Doncaster Rovers site, and this they did while travelling to other sites, they diverted at one point to the Doncaster site. Mr. O’Connor has informed the Tribunal that though the project was not of much interest to him, while at the Doncaster Rovers site, Mr. Phelan referred extensively to the completion dispute with the vendors. Although the matter was of no particular significance as far as Mr. O’Connor was concerned, he believes that he would have commented that the matter should be easily resolved as the issue related to specific items. Mr. Phelan at that time — that is, Mr. Kevin Phelan — conveyed other information to Mr. O’Connor concerning the background to the project and the personalities involved which Mr. O’Connor considered to be interesting in itself, but of no particular interest to him. He has stated that subsequent to his visit, he would have reported to Mr. Michael Lowry as to what he had seen and as to what his impressions were in relation to the various properties shown to him. Mr. Lowry likewise has informed the Tribunal that subsequent to that visit, he recalls some general discussion with Mr. O’Connor, and his recollection is that nothing of significance had arisen in relation to the visit. From what Mr. O’Connor has informed the Tribunal, it appears that he first became aware of any suggestion, whether correct or incorrect, that Mr. Lowry may have been involved in the Doncaster Rovers transaction in late 2001 or early 2002. He recalls that in or around that time, a journalist queried Mr. Lowry’s solicitor whether he believed Mr. Lowry was involved in the Doncaster Rovers project. Mr. O’Connor recalls that he discussed the matter with Mr. Lowry’s solicitor and that he subsequently discussed it further with Mr. Lowry, and from those discussions, he formed the view that the story was groundless and that the queries were prompted by some third party seeking to create mischief. It appears that sometime later in 2002, probably in May or June, Mr. O’Brien Snr. telephoned Mr. O’Connor (this is from information made available by Mr. O’Connor) and Mr. O’Connor has informed the Tribunal that in the course of what he described as a general conversation, Mr. O’Brien asked Mr. O’Connor how familiar he was with the Doncaster Rovers project. Mr. O’Connor’s reply was that he was not familiar with it, to which Mr. O’Brien Snr. responded that he just wanted Mr. O’Connor to know that he, Mr. O’Brien Snr., was absolutely dealing with the project, or words to that effect, from that time onwards. He went on to ask Mr. O’Connor whether he had heard rumours about a connection between Mr. Lowry and the project, to which Mr. O’Connor replied that he had heard the rumours, but that to his knowledge and belief, Mr. Lowry had no involvement in the project. Mr. O’Connor had further contact with Mr. O’Brien Snr. in or around August of 2002, when Mr. O’Brien telephoned him again and invited him to a meeting at his — that is, Mr. O’Brien’s — offices. Mr. O’Connor’s recollection was that he met Mr. O’Brien in his office in the Malt House and that once again, in the course of a general conversation, Mr. O’Brien Snr. asked Mr. O’Connor what he knew about the roles of Mr. Kevin Phelan, Mr. Richardson and Mr. Weaver in the continuing dispute regarding retention monies in relation to the Doncaster Rovers project. In the course of confirming that he had no knowledge apart from what he learned from Mr. Kevin Phelan, Mr. O’Connor inquired as to what the dispute was all about. He then learned from Mr. O’Brien that a mediation or arbitration meeting had been scheduled for September or October, and that if this failed to achieve a resolution, a date had been fixed for a hearing of the dispute between the parties in the High Court in June 2003. Mr. O’Connor has informed the Tribunal that Mr. O’Brien Snr. indicated to him that he felt that enormous pressure was being exerted by Mr. Richardson, who was seeking to recover in excess of the sum held in the retention fund and that Mr. O’Brien made a definite point that he would not be blackmailed or bullied on this. Mr. O’Connor’s view was that even though the matter was not of concern to him, he could not understand how it appeared that what he characterised as a simple arithmetical issue could not be resolved or substantially resolved, and he offered any assistance that he could provide. Sometime shortly after, Mr. O’Brien Snr. again invited Mr. O’Connor to meet him. When Mr. O’Connor called to Mr. O’Brien’s office, Mr. O’Brien asked him to look at some figures relating to the DRFC dispute, but when Mr. O’Brien went to get the figures, it transpired that they were with his London solicitors. At the time, Mr. O’Connor was conscious of the fact that he was due to travel to the UK in connection with the business affairs of another client, and he offered to review the figures on his next visit. Sometime later, it appears that Mr. O’Brien Snr. contacted Mr. O’Connor again, and arrangements were made for Mr. O’Connor on his planned visit to London to meet with the firm of Carter-Ruck solicitors, the solicitors handling the O’Brien interests in the dispute concerning the Doncaster Rovers project. Mr. O’Connor travelled to London on the 10th September, and sometime in the afternoon on that day he attended at the offices of Carter-Ruck where he had a meeting with Ruth Collard and Mr. Craig Tallents. Mr. O’Connor’s recollection is that he would have outlined his meeting Kevin Phelan, visiting the site, and discussing the retention issue, together with the arbitration scenario, with Mr. O’Brien Snr. He also recalls that his representation of Mr. Lowry would have come up, as would what he believed to be the mischievous attempt to bring Mr. Lowry into the equation. There was some discussion on the retention issue, with Mr. O’Connor saying that he would like to go through the figures in detail. Ms. Collard arranged to have the documents made available to him, and he left the office, returning an hour later to collect the relevant material. Mr. O’Connor has been provided with an opportunity to examine the attendance note of Ms. Collard recording her meeting with him. He has informed the Tribunal that there is considerable misunderstanding on Ms. Collard’s part, and he has stated he believes he would not have made the statement suggesting Mr. Lowry did have a connection with the proceedings, as he never understood that Mr. Lowry had any involvement with Doncaster, and furthermore does not believe that Mr. Lowry was ever present at any meeting between Mr. Kevin Phelan and Mr. Ken Richardson. He has, however, stated by way of comment on the contents of Ms. Collard’s note and in particular her references to Mr. Lowry’s connection with the Doncaster transaction, that in the course of discussion with Ms. Collard and Mr. Tallents, he would have mentioned that there was always the possibility of persons with vested interests seeking to involve his client in the transaction in an improper way. He has also stated that the reference in Ms. Collard’s note to an involvement of Mr. Michael Lowry was due to a misunderstanding, and that if he stated that Mr. Michael Lowry had an involvement, Mr. O’Connor was making such a comment solely with reference to the ongoing Tribunal hearings and the suspicion that attempts were being made by third parties to convey the impression that Mr. Lowry had an involvement. Mr. O’Connor stated that this in itself was viewed by him as an involvement, and that this was all he was seeking to convey, and that he never understood or believed that Mr. Lowry had any legal or financial involvement with the Doncaster Rovers project. With reference to the note made by Ms. Collard to the effect that Mr. O’Connor had stated that Mr. Lowry had been in a room when discussions had taken place between Mr. Kevin Phelan and Mr. Ken Richardson regarding a lease, Mr. O’Connor says he cannot explain this reference to Mr. Lowry and that his view is he could not have made such a statement as he had no knowledge of the matter and that it had always been his understanding that Mr. Lowry had never spoken or met with Mr. Ken Richardson. With regard to the suggestion that Mr. O’Connor would be briefed to enable him to take part in settlement negotiations, Mr. O’Connor states that in the course of a general discussion as to how a settlement could be achieved, it may well be that an impression was created that he, Mr. O’Connor, if requested, would meet with the parties involved on the other side with a view to endeavouring to resolve the matter. He is certainly prepared to accept that Ms. Collard and Mr. Tallents were aware that he could possibly be viewed as someone who could liaise with, if not with the other side, at least with Mr. Kevin Phelan. Mr. O’Connor did work on the material provided to him by Ms. Collard and reported to her with his findings. So far as the question of meeting with the representatives of the vendors is concerned, Mr. O’Connor states that any contemplated meeting never took place and was never arranged, and his understanding is that the matter was finally resolved between the parties, and that he was so informed by Mr. O’Brien Snr. sometime shortly after the conclusion of his dealings with Ms. Collard and Mr. Tallents. While Mr. O’Connor has made the foregoing comments concerning his meetings with Ms. Collard, and in particular her attendance note, he has also informed the Tribunal that sometime in or around August or September of 2002, Mr. Kevin Phelan contacted him by telephone and mentioned that he had met with Mr. Ken Richardson, who had told him that the retention issue was becoming a big issue, and that Mr. O’Connor believed that Mr. Phelan was seeking to establish that Mr. O’Connor could intervene; that he, Mr. O’Connor, indicated that he would be prepared to do so, but that such intervention was outside the scope of his authority, but he suggested that Mr. Phelan contact Mr. Denis O’Brien Snr. From documents made available by Mr. O’Brien Snr., it would appear that Mr. O’Brien informed the English police that in the week prior to the mediation, on the 27th September, 2002, he was faxed a copy of the letter from Mr. Christopher Vaughan to Mr. Michael Lowry dated 25th September, 1998. He made — he eventually brought this matter to the attention of the London Metropolitan Police, and he has made a number of statements to the police, and in an initial statement in which he complained that he and his family were being blackmailed, he acknowledges that the letter suggests that Mr. Lowry was connected with the Doncaster transaction, but states that this was untrue. He states that the confusion regarding Michael Lowry’s involvement in the Doncaster Rovers transaction may have arisen by reason of the fact that the property agent, Kevin Phelan, who brought the transaction to the O’Brien interests, that is to Westferry, was also involved in introducing property transactions in England to Michael Lowry and that in addition, Mr. Aidan Phelan, who had acted as a financial consultant to his son, Denis O’Brien, was also involved in transactions for Michael Lowry. From the material made available by Mr. O’Brien Snr., it would appear that he stated to the English police that he had received a message by Mr. Michael Lowry’s accountant, Mr. Denis O’Connor, which he was told originated from the representatives of Dinard, Mr. Ken Richardson and Mr. Mark Weaver, advising him that a copy of Mr. Vaughan’s letter to Mr. Lowry was in their possession and that it would be in his family’s best interests to settle the litigation in a friendly and generous manner, and that otherwise a copy of the letter would find its way to the Tribunal or to the newspapers, and that the information concerning this matter had come from Kevin Phelan. It appears that in a later statement to the English police, Mr. O’Brien Snr. may have qualified or revised this statement, though the Tribunal has not yet been furnished with a copy of that statement. When Mr. O’Connor was made aware of the statement, he informed the Tribunal that the suggestion that he conveyed a message originating from Dinard advising that it was in the O’Brien family’s best interest to settle the litigation in a friendly and generous manner was simply not true. He has informed the Tribunal that around September of 2002, his receptionist informed him that Mr. Mark Weaver was on the telephone and that he wished to speak to him. Mr. O’Connor refused to take the call and indicated that he would not be taking calls from Mr. Weaver either then or at any future time. There were a number of further telephone calls from Mr. Weaver to Mr. O’Connor’s office, including one in which Mr. Weaver informed Mr. O’Connor’s receptionist that he was sending through a fax and to arrange for the fax to be received by Mr. O’Connor. Mr. O’Connor informed the receptionist that he did not wish to see anything from Mr. Weaver and that the fax should be forwarded to Mr. O’Brien Snr. It would appear that at some point in September 2002, a fax was received in Mr. O’Connor’s office from Mr. Weaver, and while Mr. O’Connor has stated that he did not see the fax, he believes that the fax was a copy of the letter dated 25th September 1998 from Mr. Vaughan addressed to Mr. Lowry. Mr. Lowry has informed the Tribunal that he has no recall of ever having had sight of the letter of the 25th September, and feels that if he had received such a letter, he certainly would have recalled the content, as he never had any beneficial, legal or material interest in the Doncaster Rovers property. Mr. Lowry agrees that he travelled to the UK in September, 1998, but that the primary purpose of his visit was to attend for medical examination at a BUPA medical centre, the appointment having been made for him through Mr. Kevin Phelan. He was collected from Birmingham airport by Mr. Phelan, and by arrangement, they went to a hotel premises in Northampton, where they had a meeting with Mr. Christopher Vaughan. Mr. Lowry says the meeting was a social one, and that over drinks, there was a wide-ranging discussion, including a general chat, as he puts it, on the Mansfield property. As it had been arranged to have a specific meeting in Mr. Vaughan’s office the following morning in relation to the Mansfield project, Mr. Phelan took the opportunity to review his other ongoing dealings with Mr. Vaughan. Mr. Lowry has informed the Tribunal that if Mr. Kevin Phelan created the impression with Mr. Christopher Vaughan or if Mr. Christopher Vaughan made the assumption that Mr. Lowry had some involvement with Doncaster Rovers, then this was erroneous. On the following morning, Mr. Lowry and Mr. Vaughan had a detailed discussion in Mr. Vaughan’s offices in relation to the Mansfield property. Subsequently Mr. Vaughan drove Mr. Lowry to the prearranged BUPA appointment in Leicester. There were only two people in the vehicle in the course of the trip from Northampton to Leicester, namely Mr. Vaughan and Mr. Lowry himself. Mr. Lowry has also informed the Tribunal that on the 24th September 1998, that is to say in the course of his first meeting with Mr. Vaughan in Northampton, he neither took nor received documentation nor correspondence from Mr. Vaughan. I want now to return to the information Mr. O’Connor has made available to the Tribunal. Mr. O’Connor has informed the Tribunal that at no time did he make Mr. Lowry aware of any of his dealings with Mr. Denis O’Brien Snr., or with Ms. Ruth Collard, in relation to Doncaster Rovers. Mr. Lowry himself has informed the Tribunal that he is at a total loss as to what was going on, and he has further informed the Tribunal that he had no knowledge of any of the matters resulting in the complaint to the London Metropolitan Police. Mr. Aidan Phelan has informed the Tribunal that he was contacted by telephone by Mr. Denis O’Brien Snr. in relation to the letter of the 25th September, 1998, at sometime in September of 2002, and that at that time he spoke to Mr. Vaughan about the letter. Mr. Vaughan explained to him that there had been a misunderstanding, and that what he was informed by Mr. Vaughan at that time accords with what Mr. Vaughan explained to the Tribunal in his letter of the 6th March. Mr. Vaughan confirmed to Mr. Aidan Phelan that in September, 1998, he had been attempting to set up a meeting with Mr. Aidan Phelan to follow up on issues arising from the Doncaster Rovers deal which had closed in August of 1998; that when Mr. Kevin Phelan therefore contacted him, Mr. Vaughan, with a view to setting up a meeting with Mr. Lowry for the purpose of discussing the Mansfield project, Mr. Vaughan assumed that Mr. Aidan Phelan would be attending the meeting arranged by Mr. Kevin Phelan. Mr. Vaughan informed Mr. Kevin Phelan that he had attempted to fax a copy of the agenda of the meeting to Mr. Aidan Phelan but that he had directed the fax to the wrong fax number; that Mr. Kevin Phelan, accordingly, had no idea that the meeting was taking place. Mr. Vaughan further informed Mr. Kevin Phelan that during the course of the meeting, Mr. Vaughan raised some Doncaster Rovers issues with Mr. Kevin Phelan and that Mr. Michael Lowry gave the impression, erroneously, that he was involved; that on that basis, Christopher Vaughan wrote to him on the 25th September; that when Kevin Phelan saw the terms of the 25th September letter, he informed Mr. Christopher Vaughan that Michael Lowry had misrepresented the position regarding his involvement in Doncaster Rovers and that he, Kevin Phelan, confirmed that Mr. Lowry had no such involvement. Mr. Aidan Phelan has also informed the Tribunal that when this matter was brought to his attention, Mr. Denis O’Brien informed him that Messrs. Richardson and Weaver, having obtained a copy of the letter of the 25th September 1998, attempted to use it during the course of the mediation with Westferry. Mr. Phelan’s understanding is that Mr. O’Connor persuaded Mr. Denis O’Brien Snr. that he was in a position to sort out the dispute between Westferry and Richardson, and that Mr. Denis O’Brien Snr. agreed with this offer of assistance. By way of qualification concerning some of the material provided by Mr. Christopher Vaughan, I should say that in a letter of the 8th September, 2004, addressed to the Tribunal’s solicitor, Mr. Vaughan, in dealing with a number of other matters, informed the Tribunal that in his view, that Mr. Lowry was mistaken in suggesting that he had first met Mr. Vaughan in a hotel premises in Northampton. Mr. Vaughan insists that he met Mr. Lowry in the boardroom of his office, and that he neither went to a hotel nor had drinks socially with Mr. Lowry. He also informed the Tribunal that he met Mr. Lowry purely for business, in his own premises, and that the Doncaster Rovers files were in his office at that time, and that his office was close to the boardroom and the files were available to be looked at. In summary, therefore, while the information provided to the Tribunal is in many respects confusing, the Tribunal has nevertheless obtained information to date suggesting that Mr. Lowry may have been involved in the Doncaster Rovers transaction. It is with a view to examining this material that the Tribunal has determined that it should proceed to public sittings so as to enable the Sole Member to conclude one way or another whether Mr. Lowry was involved in the transaction, and if so, the true extent of that involvement and whether that involvement, if any, entailed the conferring of a benefit on Mr. Michael Lowry. It is important to repeat that from information made available to the Tribunal at the time that the Doncaster Rovers transaction was first referred to in the course of the Tribunal’s public sittings, the transaction appeared to be one with which Mr. Lowry had no connection and in which he had no involvement whatsoever, and that the official documents, as I have described them, excluded any involvement of Michael Lowry in the project, but that there appear to be contradictions between what is contained on the face of those documents on the one hand and the contents of Mr. Vaughan’s letters of the 25th September, and of the 6th March, and the material available — made available to the Tribunal by Ms. Ruth Collard, and in particular, her attendance note of the 10th September, 2002. The Tribunal is examining this material, having regard to the provisions of the Term of Reference (e), and having regard to the provisions of the Terms of Reference whereby the word “Payment” is defined as including money and any benefit-in-kind. A benefit in kind in this context, as far as the Tribunal is concerned, may include the granting of an interest in an asset or in a transaction concerning an asset such as the Doncaster project and the nature of such an interest warrants inquiry where no consideration in the commercial sense appears to have passed, on the face of the documents, in return for any such interest. The Tribunal will also more specifically wish to inquire as to what prompted Mr. O’Connor’s initial involvement in the Doncaster Rovers transaction; what interests, if any, he represented in the course of his involvement; the nature of the interest he represented in the course of his dealings which, according to Ms. Ruth Collard, he had with Mr. Phelan and Mr. Richardson; and the basis upon which he represented himself, according to Ms. Ruth Collard, as having capacity to negotiate with Messrs. Richardson and Weaver. Now, Sir, the Tribunal had envisaged having Mr. O’Connor available to give evidence tomorrow, anticipating that no further material would be dealt with today. Unfortunately, for understandable reasons unconnected with any of the evidence he has given, Mr. O’Connor is not available and will not be available until Tuesday. CHAIRMAN: Well, I’d very much hoped, in the light of what was said earlier, that we will get going, Mr. Healy, but I have some knowledge. It’s unnecessary to dwell upon it, and I am in agreement; it would be wrong not to afford him until next Tuesday at 11 o’clock to take up his evidence. And I think witnesses have been fixed for the balance of that week and the following week, which hopefully will deal with this matter. Very good. Adjourned till next Tuesday. MR. McGONIGAL: Before you rise, Mr. Chairman, there are a few remarks that I think it would be appropriate that I think I should make in the light of the opening by your counsel of the issue in relation to Doncaster Rovers. First of all, can I say that while everyone, particularly my client, would applaud any indication that this Tribunal is coming to an end, the Tribunal is leaving it in a very unsatisfactory situation as to the reasons why this Tribunal did not conclude before the end of July 2004. This Tribunal, which was first set up on the — by order of the 27th September of 1997, is now seven years in existence, and it was in 2001 that the Tribunal first commenced its inquiries into what has become known as the money trail and the GSM licence. Now, it seems to me that for a Tribunal to rise in April 2004 and not recommence until the 15th September 2004 requires an explanation not only to those who are participating, but also to the wider public interest with whom the Tribunal must be concerned. I have in particular listened very carefully to Mr. Healy’s outline of the issues in relation to Doncaster Rovers, and as far as I can make out, there is nothing in Mr. Healy’s opening by way of material, by and large, which was not available to the Tribunal in May of 2004, when it initially took a decision to go into this matter in public. Therefore, I am perplexed, and my client is more than perplexed, that this Tribunal is still sitting, when it had more than sufficient time prior to the end of July to finish its public sittings in relation to matters with which he was concerned. That is one aspect of the matters that I want to address you in relation to. So far as Doncaster Rovers itself is concerned, in lengthy correspondence between ourselves and the Tribunal from the 27th May, 2004, we have made it abundantly plain, first of all, that we do not see how, based on the material which the Tribunal produced at that time, that it came within the terms of reference to which Mr. Healy has referred. We have argued within the correspondence, and still hold, that there is no substantial evidence as outlined by Mr. Healy that would justify this Tribunal going into public session in relation to this issue, and we were saying that in May, June, July of 2004. We say it with even more force, having regard to material which has now become available, and which the Tribunal have had in the light of material which is in books which the Tribunal gave us, but which has not been opened by Mr. Healy, it is abundantly clear, and it should be said by this Tribunal in the loudest possible terms that the Doncaster Rovers transaction in its title deeds and documents is clearly legally held within the O’Brien interests, and that on foot of the Tribunal’s inquiries into those documents, there is no evidence, good, bad or indifferent, or any suggestion of any other interest involved in the legal title. Secondly, that having had an opportunity to examine the funding for Doncaster Rovers, it is abundantly clear that nobody other than O’Brien interests contributed to the funding arranged through his interests and that Michael Lowry had absolutely no hand, act or part in any of that. So it is clear that as of the 18th August of 1998, when the sale closed, that Michael Lowry had no interest, good, bad or indifferent, and nobody believed for a moment that he had. And that is still the situation. What the Tribunal have focused in on is two comments by two solicitors: One made in September of 1998, and the other made in 2002 by Ruth Collard. Turning firstly to the period in 25th September of 1998, whatever took place took place in the offices of Christopher Vaughan. The persons who were present, and therefore the persons that the Tribunal would have been seeking evidence from, were both Kevin Phelan and Christopher Vaughan. It is incomprehensible, and in my respectful submission, ultra vires the power of this Tribunal, to proceed into public examination of this issue without calling Kevin Phelan and Christopher Vaughan. I have to say that I was slightly surprised when Mr. Healy suggested that there was a possibility that Mr. Vaughan might still give evidence. I say that because I believe the position to be that the Tribunal is well aware, and has been aware for some considerable time, that there was no intention on the part of Christopher Vaughan to come and give evidence before this Tribunal. And indeed, to put it in context, it is clear from the transcript of the interview carried out by Tribunal counsel on the 9th September, the document which has been furnished to us only very recently and which was not opened by Mr. Healy, that the only reference to the possible attendance of Mr. Vaughan in this Tribunal was by Mr. Coughlan at page 86, when he said, “I suppose there is one thing that I should ask you formally on behalf of Michael Moriarty: He would still be delighted if you would consider coming to give evidence at the Tribunal. Now, it is unfair for Mr. Healy to have suggested that there was a possibility of Mr. Vaughan coming to give evidence. You, Sir, know, not only from that, but also from other material, that Mr. Vaughan’s stated position is that he will not come, and he has identified the reasons, particularly in a letter to Kelly & Company, copy of which we also have been shown. Now, what puzzles me is that knowing that Mr. Vaughan was not available to come and give evidence, the Tribunal set up a private meeting between themselves and Mr. Vaughan on the 9th September. Nobody else was alerted to this meeting. Nobody else was invited to this meeting. It’s not clear at the present time that bearing in mind in July the Tribunal knew that Mr. Vaughan would not be coming, it is not clear why the Tribunal did not attempt or try and see whether Mr. Vaughan would consider giving evidence on commission in London. Even if he was not prepared to do that, it is difficult to understand why parties were not contacted with a view to seeing whether there were any questions which they might want asked, even if Mr. Vaughan was not prepared to see them. But one thing is absolutely clear, without Mr. Vaughan, that he has totally ruled out by way of explanation any involvement of Mr. Lowry in that transaction. He corrected it — it was corrected — his impression was immediately corrected at the time by Kevin Phelan, and he gave that explanation in his letter of the 6th March, and he has reiterated that in his interview, which has not been opened, and he has made it plain that involvement was, in his terms, Mr. Lowry seeing if he could help. It is difficult to understand how this Tribunal can proceed in relation to this issue without the benefit of Mr. Vaughan. Equally, it is difficult to see how it can proceed without Mr. Phelan. Mr. Phelan, after all, is the man who was present and who instigated or brought Mr. Lowry to the meeting where they discussed various properties. Mr. Phelan, in correspondence with the Tribunal, has equally made it clear that Mr. Lowry had no involvement, and he did so in a letter of the 17th August of 2004, which we have a copy of both from the Tribunal and from Mr. Phelan. And that letter reads: “I refer to your letter dated July 22nd 2004 and your letter to Woodcock & Sons, July 13th 2004. “I confirm Woodcock & Sons are not instructed on my behalf at this time. As indicated in your letter of July 13th 2004 to Woodcock & Sons, I have not had any correspondence with the Tribunal in two years. I am, therefore, surprised to have now suddenly had correspondence from the Tribunal. I have, however, had significant contact from parties in the United Kingdom over the period since I last had contact with the Tribunal. The contact on many occasions was very disturbing, to say the least. It’s been apparent that other parties have been carrying out their own independent investigation other than that of the official Tribunal. The parties I refer to are a firm of Irish solicitors who apparently act for or are retained by a large telephone company. “I was shocked to learn that people who I had dealings with in the United Kingdom had been requested to make contact with the Tribunal with the sole purpose, as I understand it, of generating maximum embarrassment for some individuals who are currently attending the Tribunal. “I am aware that the investigating solicitors have targetted people who are in some way disgruntled in respect of their commercial dealings in a project involving Doncaster Rovers Football Club. Indeed, I believe the solicitors represent disaffected parties also. “I am further aware that individuals have been encouraged to visit the Tribunal in order to create difficulties for parties who are attending the Tribunal. I have had it confirmed to me that the investigating Irish solicitors have attended meetings, along with their American colleagues, at RWS Ashworth, Solicitors, in Malton, North Yorkshire. This firm represented the vendors in the sale of shares in Doncaster Rovers Football Club and also act for Ken Richardson, the person behind the football club. “I understand other firms of solicitors were contacted as part the overall investigation. I understand Mr. Richardson and his representative Mr. Weaver were encouraged to visit the Tribunal in Dublin following his release from a United Kingdom prison. I have been requested to make available information to third parties, but only if the information would cause problems for individuals who are currently attending the Tribunal. I corresponded with Richardson and Weaver on February 23rd in respect of this and other issues which concerned me. I had previously indicated to the solicitor from the Tribunal that I did not wish to be involved with the Tribunal. I have not changed my position since the Tribunal injudiciously allowed the publication of my home address in the national media. I am now more reluctant to involve myself with the Tribunal, taking into account the sinister activities which have been occurring and which have been allowed to occur over the past period. The activities involved parties carrying out parallel investigations and prompting others to make contact with the Tribunal. CHAIRMAN: I think there was a response over lunch. It would certainly seem preferable that these matters be held over until next week. CHAIRMAN: I think there was a brief response from Mr. Phelan over lunch and an intimation he might write in more detail. And it may be preferable that it be kept until that situation has been ascertained next week. MR. McGONIGAL: That is right. There is a letter of the 13th September from Mr. Phelan to Mr. Heneghan. “It is regrettable that you have interpreted my letter of August 17th as a criticism of the Tribunal. I was requested by your own solicitor in correspondence to make written comments in respect of queries the Tribunal is contacting in relation to Doncaster Rovers. And that is the position in relation to Mr. Phelan. But it’s abundantly clear that Phelan and Vaughan, the two persons who were present with Lowry on the 24th and 25th September, are essential witnesses to this Tribunal, if it is properly going to understand what happened at that place, and there is no short-circuiting that. And to short-circuit it is to damage the interests of people represented here. That equally applies to the absence of other witnesses on the other side of the coin, which is Mr. Weaver and Mr. Richardson, and to a lesser extent, Mr. Moloney and a Mr. Wilkes, although whether Mr. Wilkes exists or not, I am not a hundred percent sure. Again we have a situation where Mr. Weaver, in a communication with Mr. Vaughan, indicated that — again a document which we have — indicated that he was aware that Lowry had no involvement. And that is in one of the Tribunal books — 15, I think; I don’t know. It’s a document which appears at a Tab I in a book beginning “LK Shields Solicitors”, and it’s towards the end. MR. HEALY: That’s not a book that’s in the public domain. It’s not a book that has been made available to individuals involved in dealing with the evidence to be heard at these public proceedings; not yet. I am not sure what Mr. McGonigal wants to refer to, and it may be that that information that Mr. McGonigal wishes to refer to may be of interest or use to him in dealing with some of the evidence that’s due to be heard, but I don’t see why it should be appropriate to mention it at this point. MR. McGONIGAL: I’ll tell you why I am mentioning it, Mr. Healy and Chairman. I mention it because I understood I was appearing in a public Tribunal, and a public Tribunal is a place where all the material collected by the Tribunal legal team and its Chairman is supposed to go into public view when an issue is being tried. That has been the perceived wisdom for a very long time. It has been confirmed by Mr. Justice O’Neill in the O’Callaghan judgement. I understand that this Tribunal considers itself to be bound by that judgement until it is set aside, and I do not understand how we can be given one leverarch file with selected statements and documents, curried by the Tribunal from its volumes of files, and told “This is the official book to which you can relate”, and as against that, we have 15 volumes of leverarch files saying we cannot disclose those in public until somebody rules on it. “We have received a letter written by you to Mr. O’Connor dated 14th July, 2003, which has been put before this Tribunal. It has been requested that you be invited to attend the Tribunal to assist in clarification of some of the contents of the document. Please contact myself” at the telephone number “about your earliest convenience to arrange a suitable time for you to attend. Now, I have no idea, because there is no documentation showing what inquiries the Tribunal made in relation to that letter, the genuineness of it, how Mr. Weaver came to have it in his possession, and what the results of that were. CHAIRMAN: Are you suggesting it might be genuine? MR. McGONIGAL: No, I am not suggesting for a moment that it’s genuine. But I am suggesting that it is indicative by the person who produces it, Mr. Weaver, that the Tribunal should be making inquiries as to what, if anything, was going on behind it, because it’s abundantly clear that Mr. Weaver and Mr. Richardson are leading the Tribunal and others by the nose to conclusions which they wanted at the time to benefit them that had absolutely no reality in truth. And if the Tribunal had for once been able to take a decision correctly, they would have realised that they should not be going into Doncaster Rovers, because the only reason they could go — would be going into Doncaster Rovers was to further damage the interests of Denis O’Brien and his family in an unnecessary way. It is abundantly clear from anything one reads that has so far been produced to the Tribunal in private, and which they cannot lead in public because there are no rights for them, that there is nothing at all to suggest that Michael Lowry had any involvement in the Doncaster Rovers transaction, good, bad or indifferent, and that is abundantly clear from everything. The volume of evidence is in favour of that conclusion, and there is not a shred of evidence to hang against it, and there isn’t a jury in the country, never mind a criminal judge, who would allow this to go to a jury, and nor would a jury convict. And that is the state of play that this Tribunal is fiddling around with. It is prepared to damage the reputation, rather than vindicate, as the constitution calls upon it to do. It is not prepared, for once in its life, to vindicate Mr. O’Brien’s interests in a proper fashion. It is wrong for this Tribunal to continue with the Doncaster Rovers in the absence of Kevin Phelan, Christopher Vaughan, Mark Weaver, Kenneth Richardson and Mr. Moloney, who apparently has been gathering evidence on behalf of Persona or others around the nooks and crannies of England to see what he can deliver, one way or the other, to this Tribunal. These issues, if this Tribunal intends continuing with it, I will be seeking an order in the High Court on either Friday or Monday to prevent the Tribunal continuing with its investigations of Doncaster Rovers unless or until we have a proper undertaking that this matter will be looked at in full and properly, regardless of the time that is involved. It is not enough to say we have been here for seven years and we must finish this up quickly. My clients’s rights are at stake here. You have damaged them enough. This Tribunal has gone on long enough, but if it must go on for some further period to vindicate Mr. O’Brien, then it will do so properly, but only properly. CHAIRMAN: Anything you want to say in brief response, Mr. Healy? MR. HEALY: I would like to say, Sir, that the Tribunal did receive some documents from Mr. Richardson and Mr. Weaver. For reasons which the Tribunal has already explained in evidence, it did not ventilate these documents in the books. One of the reasons was that the documents, as has already been explained to Mr. McGonigal’s clients, contain an amount of material which is damaging and disparaging of a number of individuals, including Mr. O’Brien’s interests. And because Mr. Weaver and Mr. Richardson, in the view of the Tribunal, appear to have an interest to damage and to injure Mr. O’Brien and are not prepared, on the basis of the Tribunal’s dealings with them to date, to give evidence, it was felt inappropriate to ventilate any of their criticisms or allegations in circumstances where they were not prepared to back them up by exposing themselves to cross-examination. CHAIRMAN: Well I’m not going to get into a debate on the matters that have arisen to date. I did seek to indicate at the outset some of the reasons whereby the deferral since last April has taken much longer than I would have wished and how anxious I was to resume evidence, at the very latest, in mid-July. It is possible that a perusal of the 189 pages of correspondence that has flowed in that time between Messrs. Fry’s and the Tribunal solicitor may give some inkling in the difficulties that the Tribunal had in bringing the matter on. As to the substantive matters mentioned by Mr. McGonigal, I am far from unaware of aspects of frailty, of witnesses of possibly dubious provenance who were lurking in the background of the matter. In making a determination on the issue as to where to go public, I very carefully considered all of the facts in evidence that have been made available, and I considered it in the light of the recent case law, and I came to the conclusion, whilst it may well be in the taking of that evidence that the appropriate conclusion is one that may vindicate Mr. O’Brien by virtue of a finding that in fact Mr. Lowry did not in truth have an involvement in the Doncaster matter, nonetheless, on the basis of the criteria that have been set forth in recent case law in relation to this and other Tribunals, I am of the view that it was warranted that the Tribunal proceed. And indeed, to paraphrase the words of the Superior Courts in one of those cases, that in the light of what was made available, that it would have been remiss on my part had I not embarked upon consideration of the matter. Of course all evidence, whether in the other ancillary books that have been made available in relation to Mr. Phelan, in relation to Messrs. Richardson and Weaver, and any other such persons as may be in a position to assist my determination, will be afforded to any interested person such as Mr. O’Brien, and I will not make a determination until I am satisfied that I have heard all the material evidence that pertains to the matter. Very good. Tuesday at half past ten. Thank you. Or eleven o’clock, I believe I said. THE TRIBUNAL THEN ADJOURNED UNTIL TUESDAY, 21ST SEPTEMBER, 2004 AT 11AM.